Posted by aquillam in Astronomy, telescope maintanance. Last weekend, my friend Brent brought his Nexstar 6 to Astronomy at the Beach. The Nexstar is a portable computer controlled telescope with a hand controller, but Celestron didn’t really include a mount for the controller. Fortunately, there are plenty of inventive people out there! 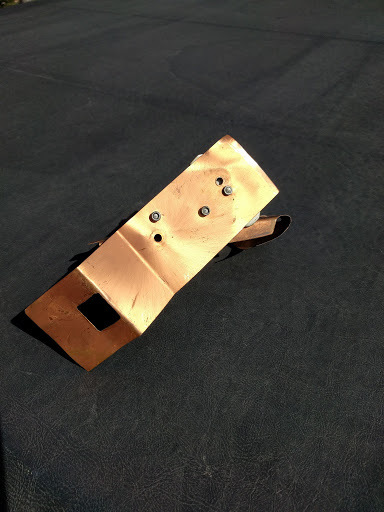 Brent and his father used plans posted on Cloudy Nights to fabricate a mount. The photos from that original post are no longer available, so I’ve added some pictures from Brent, below. There’s also an earlier post, showing an after market option, with a few other suggestions. 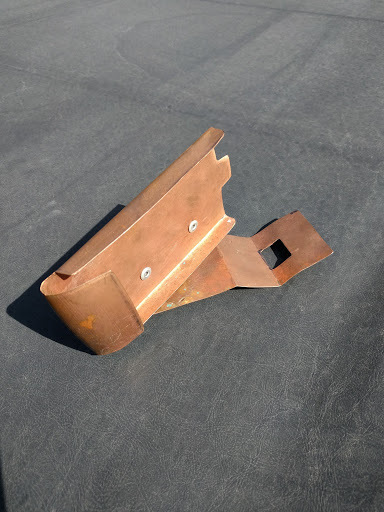 This post is one in a series about C8 repair and maintenance. You should see the introduction and disclaimers before trying anything here. A Cassegrain telescope has a large mirror at the bottom with a hole for the eyepiece and a small secondary at the top of the tube. They can have expensive, hyperbolic mirrors, or they can have some sort of corrective lens. If the corrective lens is on the front, it is a Schmidt-Cassegrain. That is what the old orange-tube Celestron 8 telescopes are, and you can tell because it says it is a Schmidt telescope right on the plate with the serial number. That corrector plate is NOT just a plane piece of glass. 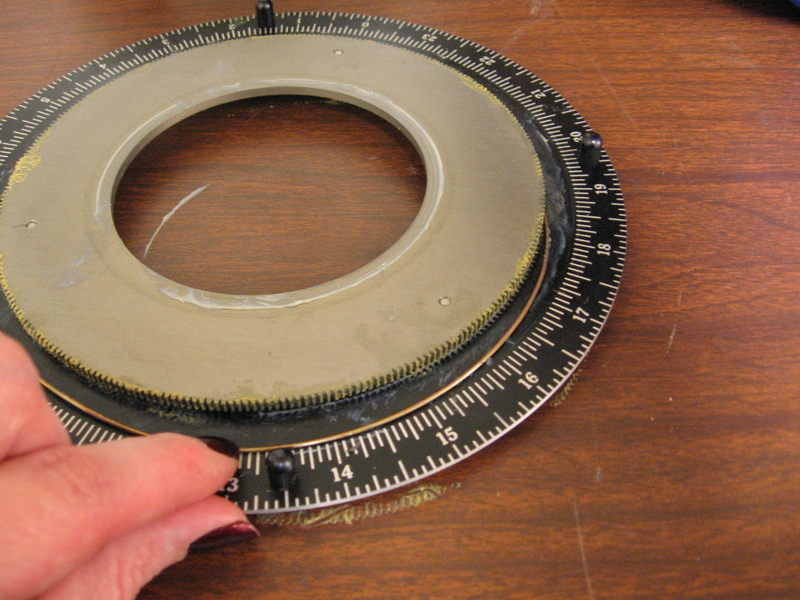 It is an integral part of the optics of your telescope, and was ground to match your primary. 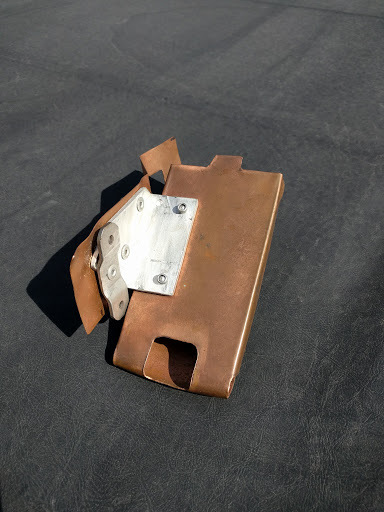 If you damage the corrector plate, it has to be replaced by Celestron, and it’s going to cost you as much as a new telescope. So, first, a really really really important warning. You must be extremely careful doing anything with the optics. In addition to the obvious problem if you break the optics, there is also the problem of keeping them aligned. If you mis-align your optics, your telescope will never be the same. You may still be able to see things, but your $800 classic telescope might be no better than a $40 department store special. If you decide that you really do want to open up your scope, you will need a small allen wrench and a pencil. Tweezers are good if you don’t have slightly long nails. Also, whatever equipment you need for whatever maintenance you want to do. Remove the screws from the retaining ring. It helps to tilt the 'scope so the screws can't roll away onto the corrector plate. 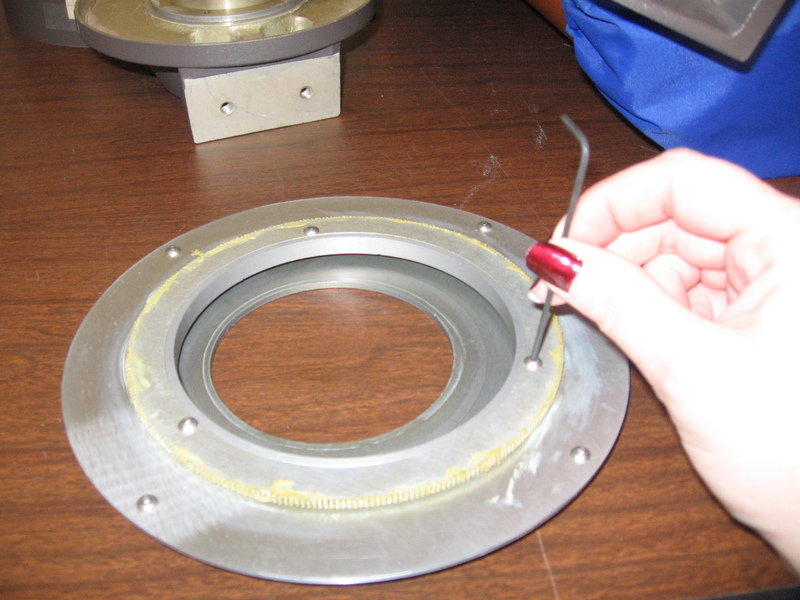 Remove the screws that hold the retaining ring in place. 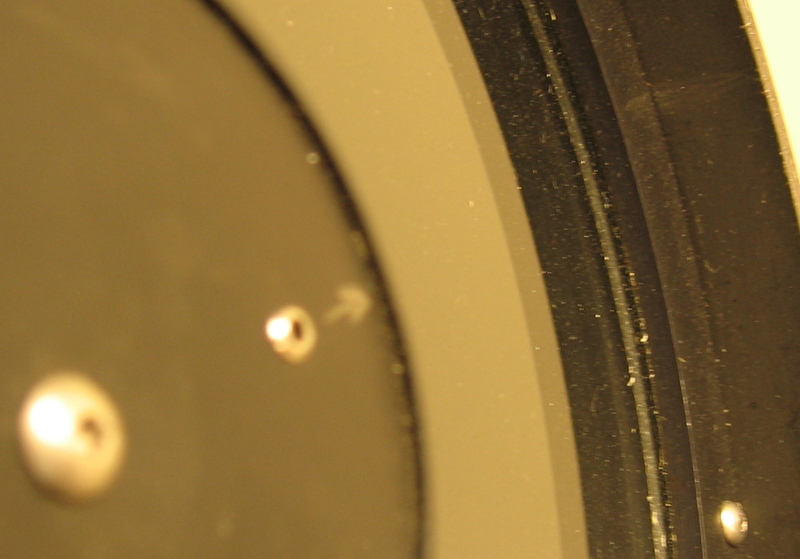 Be careful not to drop the screws as they could scratch the corrector plate. You may want to adjust the tilt of the telescope while you do this so the screws are less likely to fall onto the corrector plate. Remove the ring. I do this by hooking my thumb nails on either side and pulling outward while lifting. If you don’t have long nails, I would suggest one of those flat plastic toothpick/flossers to lift the ring until you can get hold of it without touching the part of the corrector plate that you want light to go through. Make sure whatever you use is though enough to lift the ring but won’t scratch. With the ring off, you can see the serial number on the corrector plate. It probably won’t be the same as the ‘scope’s serial number. Note the position of the serial number. Mark the outer support ring so you can realign this latter. I placed 2 marks so I can’t get confused about which part of the serial number I marked. 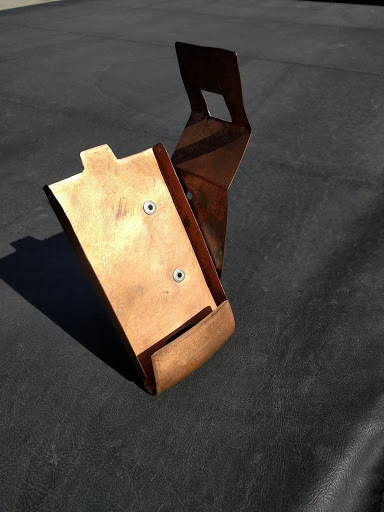 There are some boxboard or cork spacers holding the corrector plate in the correct position. Try to remove these first. A jeweler’s screwdriver or fine tweezers may be helpful, but again be careful, but again, be careful not to scratch anything. The ‘scope will be very back-end heavy once the corrector is removed, so the closer to vertical it is, the better. However, I usually find that it’s a little easier to see what I’m doing if I have the ‘scope tipped just a little bit. Make sure the dec lock in engaged and firm. 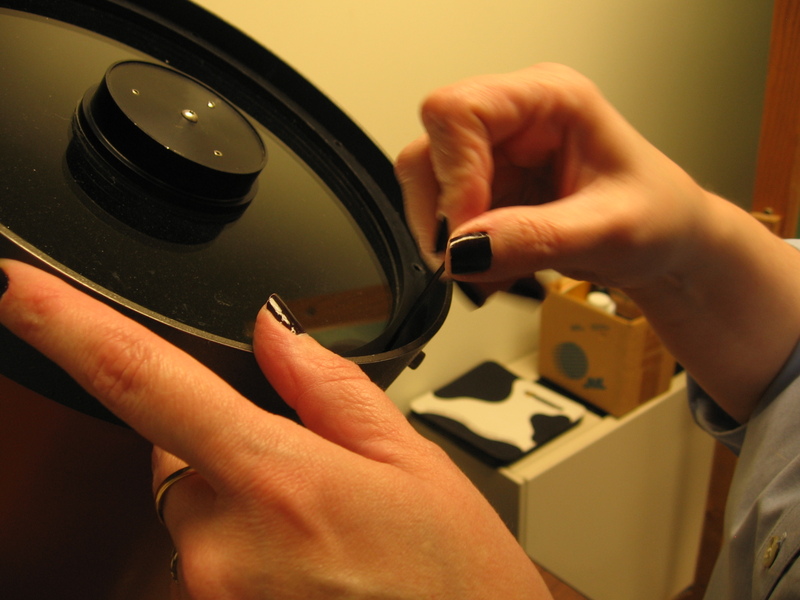 Lift the corrector using the secondary. Be very careful since this is the place you are most likely to do damage to it. If it sticks, it may come free suddenly, so be prepared for that. Hold the secondary cell and lift gently. If it won’t move, try to shift the corrector plate a little to one side. DO NOT FORCE ANYTHING! This is the part where you are most likely to damage the corrector plate accidentally. If your ‘scope has been exposed to moisture (left in the rain, used in very dewy conditions, etc. ), the corrector plate may be stuck to the interior mounting ring. 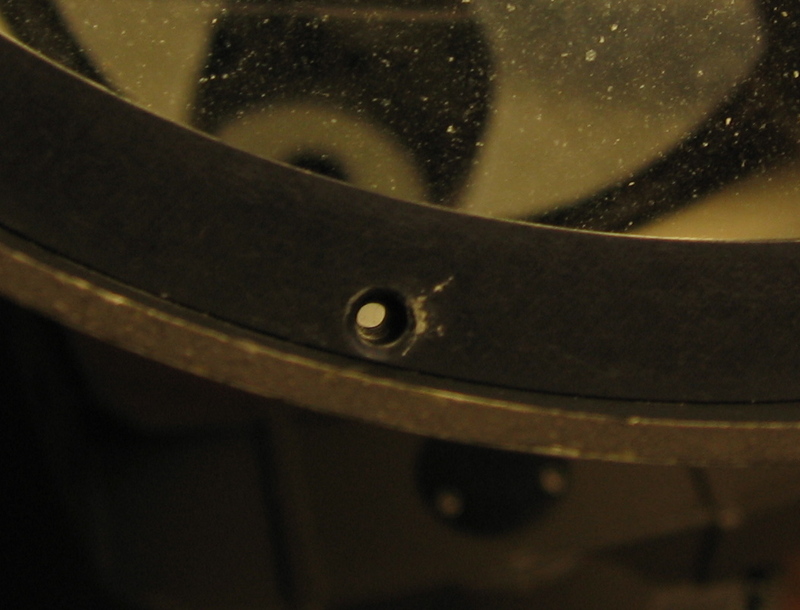 You’ll have to weigh the risks of damaging the ‘scope with the benefits of getting the corrector plate off. Patience is key. You might try something like one of the plastic toothpicks around the edge. 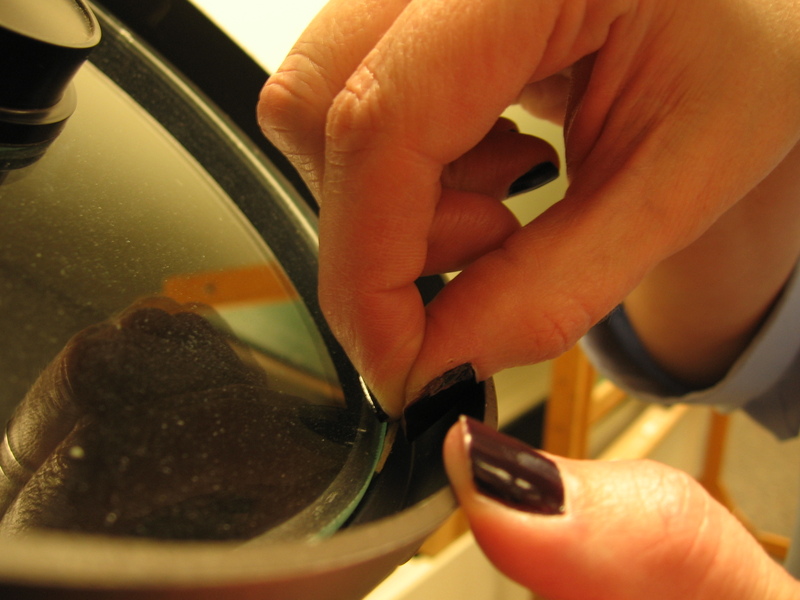 Use something that has a little give (NOT a jeweler’s screwdriver) so you don’t chip or crack the corrector. It may help to warm it a little, like with a hair dryer. Additionally, be careful not to damage the supporting ring underneath, which has a soft cover on the rim. If the corrector plate is really stuck, be warned that when it does come free, it may come free suddenly. Don’t get so immersed in trying to force it free that you don’t have a grip when it does come free. Again, patience. If you are opening it to clean it, be careful what you use. Check your manual if you still have it. Mine recommends a solution of one drop mild dish soap in a gallon of distilled water. I use a cleaner from Orion, but I usually find I have to follow that up by “huffing” on the optics to remove the final bit of film. Some commercial optics cleaners are available, which may also contain rubbing alcohol. This helps the cleaning solution dry faster and with fewer streaks or spots, but isn’t safe for all optical coatings. A note about canned air: if you get the nozzle too close to your optics, if you shake the can, or the can is not perfectly upright, you might not be pleased with the results. Condensation and propellant can come out in a glob and damage the optical coatings. You can find bulb dusters and fine brushes at camera shops 9assuming you can find a camera shop.) High quality lens paper does a very nice job too. When cleaning the inside, be even more careful than when cleaning the outside. Use a very light touch (almost not touching), and expect to go through at least half a bag of cotton balls. When reassembling, you basically do everything in reverse. Set the plate into place with the serial number aligned between these marks. Identify the location of your marks so you can replace the corrector plate. You may want to clean off the support ring the corrector plate sits on, especially if the corrector was stuck. Be sure not clean off your marks! 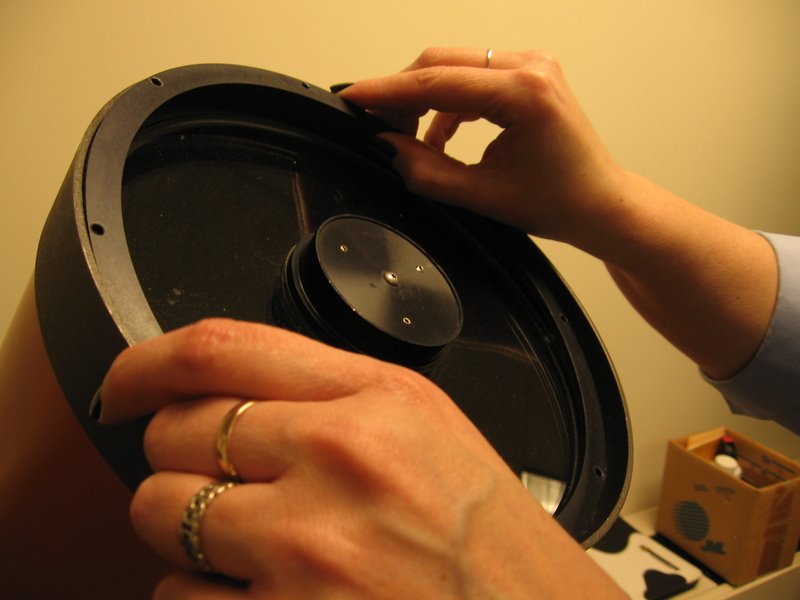 Clean it with the same solution as the optics and give it time to dry before putting the corrector plate back in. Do NOT put anything on it, no matter how hard it was to get the corrector out. Oils and solvents can damage the soft covering or generate a film that will cover the inside of your corrector plate. Replace the spacers. Tweezers may help. Set the corrector in with the serial number aligned with your marks. Slip the spacers back in around the corrector plate. 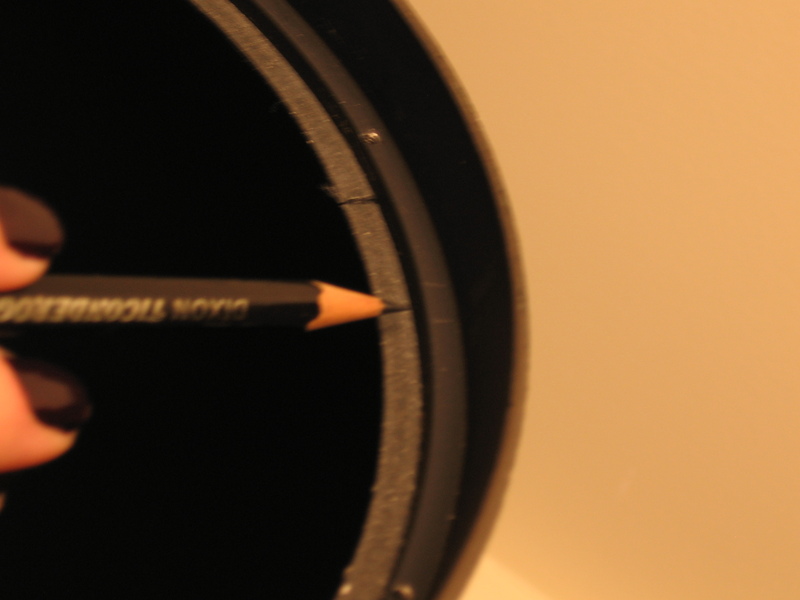 There should be 3 – 4, depending on how many are needed to keep your corrector in place. If the cork spacers are damaged, you can replace them with boxboard (like a cereal box) or folded paper. Use the cork as a template for the replacement pieces, and make sure they are shorter than the corrector plate so they don’t interfere with the outer ring. It doesn’t matter where they go, as long as they are roughly evenly spaced. Tweezers may be helpful for getting them into place. You may also need to slide the corrector plate to the side to open the gap. Push sideways on the secondary cell to move the corrector. Once the corrector and spacers are settled in place, set the ring on. 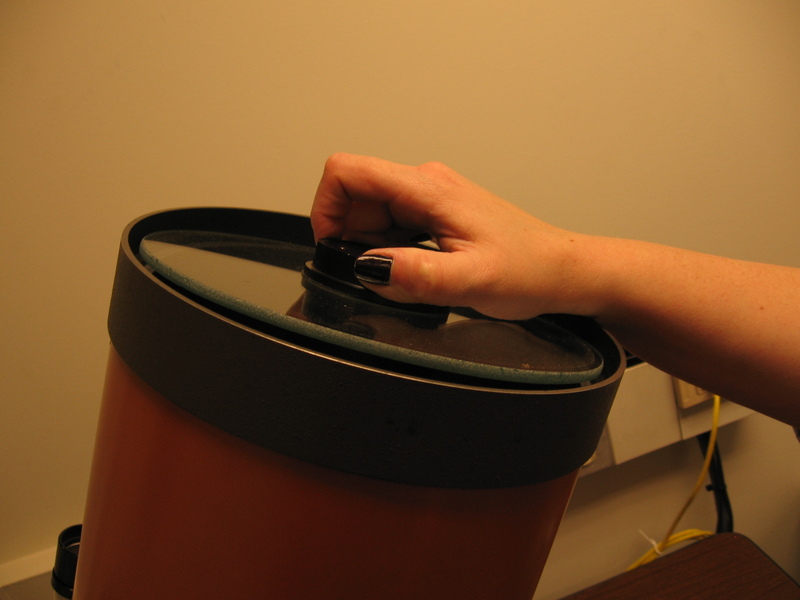 ...rotate the ring to align it with the holes in the support ring below, and push it into place. Carefully rotate it so the holes align with the holes in the support ring below, then push it down into place. Replace the screws, tightening firmly but not too hard. Chances are good you’ll have to collumate your telescope after that. But that’s a post for another day. One that follows a clear night without students. Much gratitude to Bob, who taught me everything I know about repairing and maintaining telescopes. Miss you man. 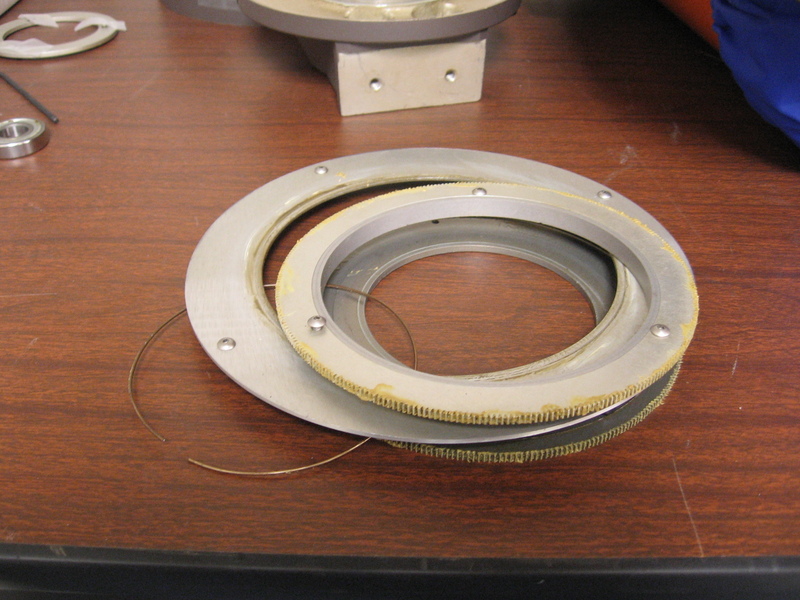 Posted by aquillam in Astronomy, MichiganAstro, telescope maintanance. This post is one in a series about C8 repair and maintenance. You should see the introduction and disclaimers before trying anything here. This is part 3 (obviously.) You need part 1: opening the base before you can do the things on this page. That’s also where you’ll find the links to the other things you can do with the base open. The gears will stay with the top part of the base when you take it apart. This is also the part where the RA lock and fine adjustment are, but that’s another post. To get to the guts, remove the ring that holds the gears to the top. As I mentioned in part 1, I usually put the screws in masking tape and tape them to the ring so everything stays together. If the ‘scope has never been opened, and it is stiff, it may be time to clean out that 30-year-old factory grease and apply some new stuff. It needs to be a good, long-lasting grease that won’t get too sticky in cold temperatures. I use whatever the department machinist has on hand. However I can tell you that the lightweight white (probably lithium) grease he gave me about 3 years ago was not a good choice. It is thin enough that it worked its way onto the RA lock in the two ‘scopes I used it on. In general, you shouldn’t have to take the gear assembly apart. If you do, be warned: there is a spring that helps keep the setting circle stationary when the telescope rotates that may try to leap out at you. Place the gear assembly on the table with the setting circle face down and remove the three screws that hold it together. The four pieces in the gear assembly. Note the spring tucked in among the gears. The grease may hold things together, so you may need to give the pieces a push to get them apart. Don’t take the screws out of the setting circle. The hold the little nubs on that make it possible to move the circle around to set the RA correctly. There should be a total of 4 pieces. The teeth and inner edge are all that needs to be greased. With the gears loosely held together with the screws, slip the spring into place. Because of the spring, re-assembling this is slightly more than just reversing what you did to get it apart (in all probability, the spring came out on its own when you loosened the third screw!) To get it back together, stack the two gears and the setting circle in order, and put the three screws in, but don’t tighten them all the way. Slip the spring in between the setting circle and the top gear. With most of the springs, it works best to put the spring on top of the top gear and fit one end in place, then feed the rest of it along until it slips into place. The spring in this ‘scope seems to be a bit shorter than usual, so it was easy to put back. Once the spring is in place, tighten the screws down the rest of the way and you’re ready to re-assemble things. If you can’t get the dec lock to hold, i may be that you need to balance the telescope in dec. To determine if you need to balance the ‘scope, first put it on the mount and load it up as you would for a typical observing session. Point the ‘scope so the tube is roughly level. Put your hand under the mirror cell so you can catch it before any equipment can be damaged. Then release the dec lock. If the ‘scope is balanced, it won’t move. If it moves, but not much or very slowly, you’re probably ok. But it it swings down like it might as well not be on a mount, you’ll need to balance it. If the dew shield isn’t enough, you’re going to need an accessory, which we don’t have, so I can’t offer and pictures or instructions on installing them. However I do have a little advice. Some tubes have a mountng hole on bottom in front to simply screw on a counterweight (espeicially if the original owner ordered the counterweights with the telescope). Otherwise you will have to pick a system and an attachment method. I like the dovetail bars since they are very easy to adjust, so if you take off the camera you just slide the weight back to re-balance. Just remember, you really want something that can use the pre-existing holes, or you want to find someone who really knows what they’re doing. If you have to drill into the OTA, you can really make a big mess of things.